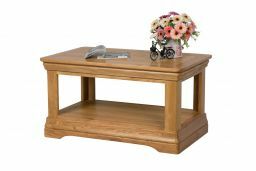 Farmhouse Oak Coffee Table with Shelf - A Brand New Design for Top Furniture. 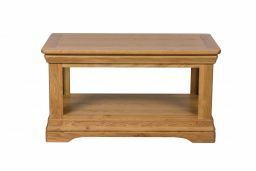 The Farmhouse Coffee Table with Shelf is manufactured from sustainable American Oak and is finished with a hard wearing oiled wax which brings out the natural beauty of the American Oak. These coffee tables have a nice and chunky design with great detailing around the top and bottom. Delivered fully assembled and ready to use. This coffee table is manufactured as part of our Farmhouse Range so will match the rest of the range. I love this coffee table. Perfect size for my room. Lovely quality wood and beautifully made. My OH is a carpenter and he was impressed with the quality especially for the price. As with the other table with drawers it is very fine finish that reflects the light from the table lamp placed on it. Very pleased with my table. Very good quality and fits perfectly in the room. Delivery as promised. 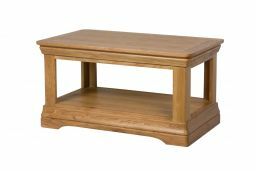 Excellent coffee table, very sturdy and just what was wanted. Also a lovely finish. Sits nicely in the middle of the front room, delivery was on time good communication which is rare these days.